Interesting and compelling right from the first lap of the race, the 2018 Verizon IndyCar Series season started with a bang at the Firestone Grand Prix of St. Petersburg. After Schmidt Peterson Motorsports rookie Robert Wickens dominated much of the race, a late run-in with Andretti Autosport veteran Alexander Rossi cost both of them the race victory while Dale Coyne Racing driver Sebastien Bourdais would pounce at the opportunity for the season-opening win. It is Bourdais’ second consecutive Firestone Grand Prix of St. Petersburg victory. In a first lap that included a spin from front row starter Will Power, Ryan Hunter-Reay pitting for a faulty ECU replacement, and Tony Kanaan spinning after contact with Zach Veach, each of them were saved by a full course caution when Charlie Kimball overshot the final hairpin turn and stalled his car. Rookie polesitter Robert Wickens would take a commanding lead early in the 110-lap event while the rest of the field fought tooth-and-nail over spots behind him. The Schmidt Peterson Motorsports pilot enjoyed a safe lead for much of the first half of the race. Fellow rookie Matheus Leist was off to a strong start running in the top five early on, but ran into issues when his A.J. Foyt Racing machine became stuck in fourth gear which forced an early pit stop. Then, on lap 29 the Brazilian driver would make heavy contact with the concrete barrier which prematurely ended his day. It would be the race’s third caution and the first for a car exiting the event. One of the more impressive rookies at the February “Prix View” test at ISM Raceway, Leist’s luck had run out after multiple near-misses in the desert. Lack of grip was a re-occurring theme as Graham Rahal overshot the entry into turn one early in the race, taking out Ed Carpenter Racing’s Spencer Pigot. Later in the first third of the race, a carbon copy of the Rahal/Pigot accident was replicated when veteran Scott Dixon overshot his turn-in and took out Takuma Sato. Just laps after Dixon and Sato brought out a yellow, Michael Shank Racing driver Jack Harvey exited the Firestone Grand Prix of St. Petersburg after a run-in that left his No. 60 Honda badly damaged on the inside of the final hairpin. The middle portion of this year’s Grand Prix of St. Petersburg was dominated heavily by Honda teams Schmidt Peterson Motorsports and Andretti Autosport. They filled the top five with drivers Wickens, Alexander Rossi, Marco Andretti, James Hinchcliffe and Ryan Hunter-Reay, who had rebounded from his early-race issues. After doing a fine job playing the caution and pit sequence to their advantage, Dale Coyne Racing and their driver Sebastien Bourdais rebounded from a poor race start to the lead with forty laps remaining. 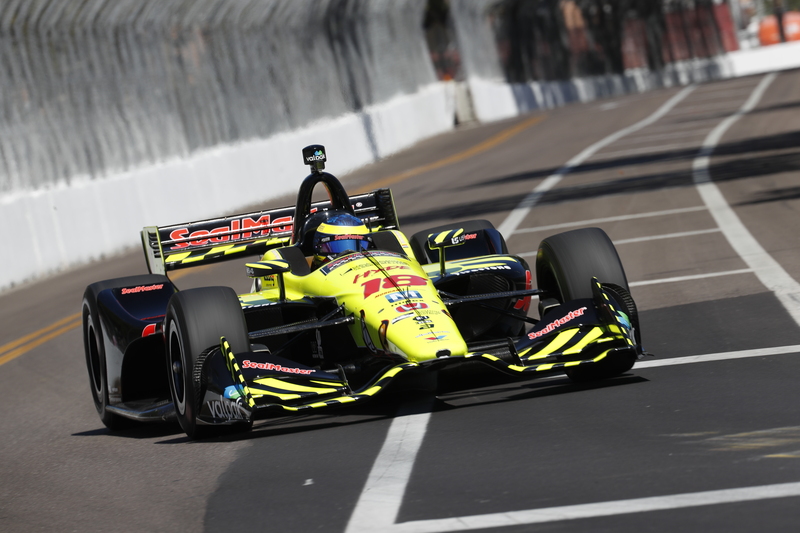 Bourdais and Wickens would conjure up a beautiful duel through this stage of the race with downtown St. Petersburg and nearby ocean waters serving as a worthy backdrop to the drama on-track. With the final pit stops falling with just outside 30 laps to go in the race, Wickens’ rival on-track would switch from Bourdais to Rossi with the two Honda drivers nose-to-tail for the final stanza of the race. Rossi reeled Wickens in after a two-plus second gap separated the pairing following the final pit stop sequence. With 13 laps remaining, the Andretti Autosport driver radioed in that he was “waiting” for the right moment to strike on Wickens when he overshot a corner with Carlin Racing’s Charlie Kimball off the pace. That expanded the gap from seven tenths of a second to over 2.5 seconds with just over ten laps remaining, forcing Rossi into a mad dash to catch the Canadian sportscar veteran. When the result looked to be determined, a full-course caution infused one last shot of drama into this 2018 Firestone Grand Prix of St. Petersburg when Juncos Racing rookie Rene Binder drove headfirst into the tire barrier in the course’s final section. After a quick restart saw Max Chilton run wide and stall, one final restart was in the works. The stage had been set for a two-lap sprint to the finish with Wickens, Rossi and Bourdais all in contention for the race win with the top eight spots being held by Honda drivers coming to the final restart of the race. After a tremendous jump on the restart, Rossi dove down to the inside of Wickens with the two drivers making contact during the first corner on the track. Rossi would continue on while the Schmidt Peterson rookie ended up hard into the concrete barrier. Bourdais, leading the second-most laps in the race, would win and assume the points lead with Honda snatching the first six spots. Graham Rahal would finish the race second, Rossi held on for third, James Hinchcliffe fourth and Hunter-Reay rounding out the top five. Stay tuned to Open-Wheels as we continue to update this story.